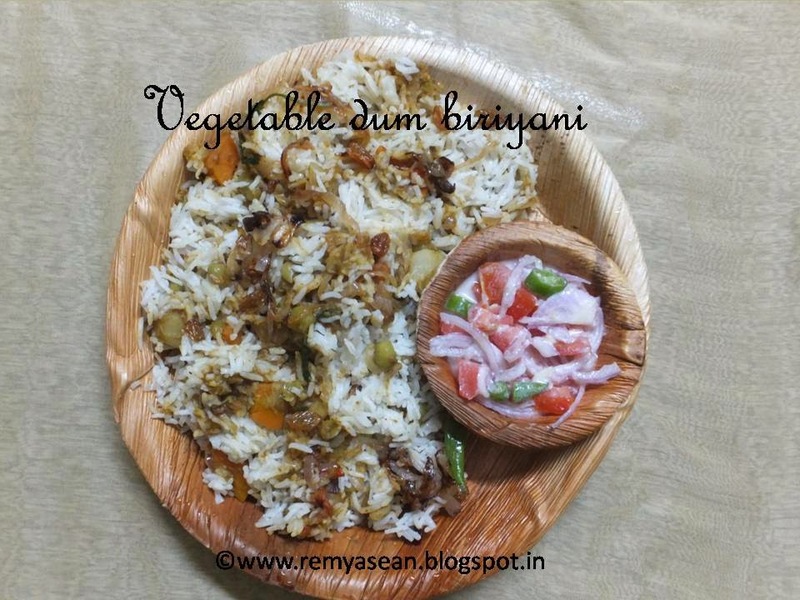 I love to eat dum biriyani.veg or non veg dum biriyani will be more flavourful.Did you check my Chicken dum biriyani recipe?I'm always searching for easy methods so prefer to make easy biriyanis.But this time I prepared dum biriyani and got good clicks(at least for me!!!!!!) too. Soak basmati rice for 30 minutes drain it and keep aside. Add cinnamon clove and cardamom.Fry it for few seconds and add sliced onion. Add drianed rice and ry it for few minutes. Now add water,salt and lemon juice. Close the cooker and place the whistle. One whistle in medium flame is enough. Heat the kadai with oil. Add onion and suate it well. Add tomato and saute it well till it get mashed with onion. Mix it well and add all the vegetables already kept aside. Add enough water and ook it well. The gravy should be little bit thick. 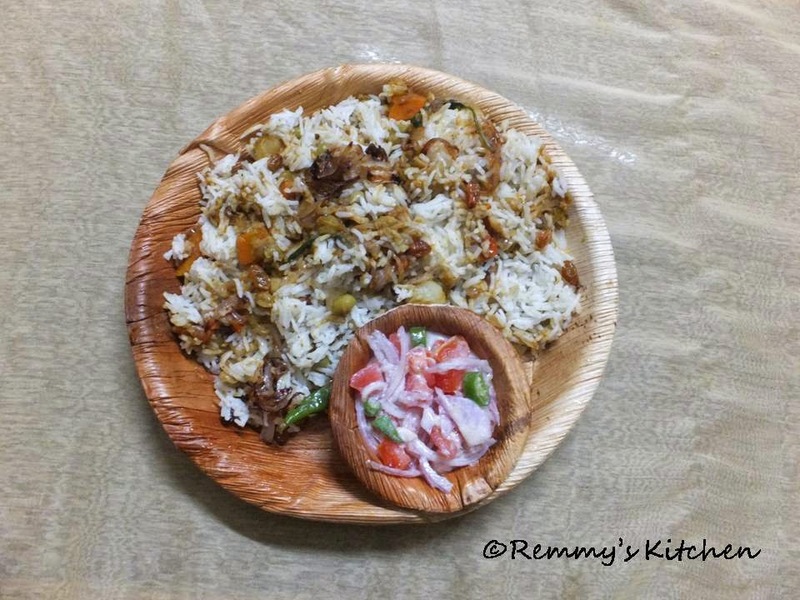 Take a biriyani pot or ue cooker itself . Then spread fried cashew kismis and fried onion. Repeat the process until the rice and masala finished. Close the vessel tightly and keep it on a hot thawa. Let it be like that for 15 minutes in low flame. Clean the cauliflower florets by dipping it in to boiling water with salt and turmeric powder before cooking. You can select vegies according to your choice. 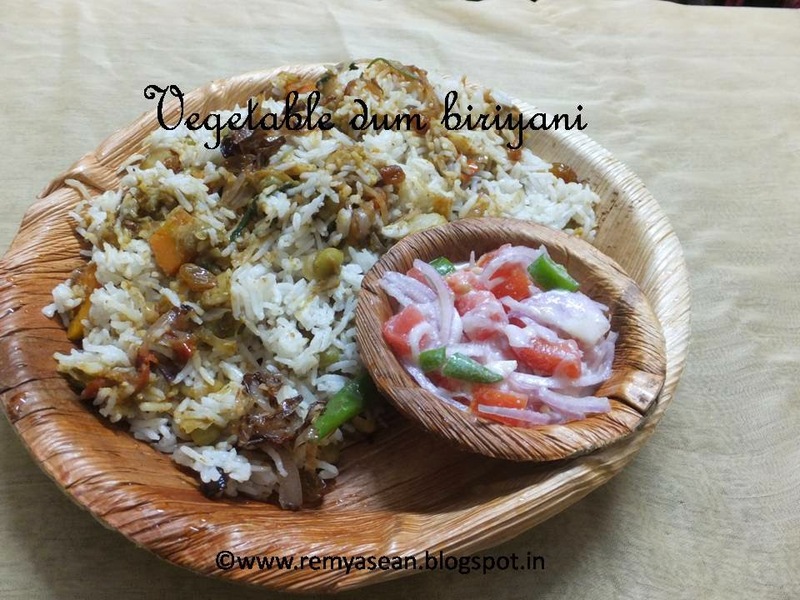 Tempting biriyani dear :) yumm ! !